Americans' perception of race relations in the United States has gotten worse since the election of President Obama, the nation's first black president according to a recent poll conducted by The New York Times and CBS. 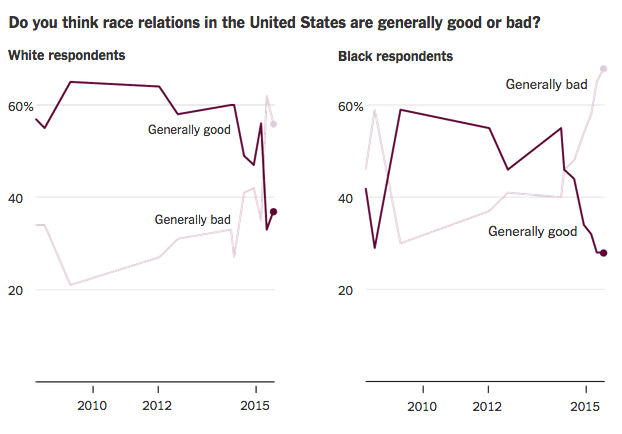 When asked whether they believe if race relations are generally bad, six out of ten respondents said yes, and four out of ten believe they are getting worse. Immediately before Obama's election, 60% of black respondents felt that race relations were generally negative, but upon his election, that number was cut in half. Now, it has skyrocketed to 68%, matching numbers close to those measured during the 1992 Rodney King riots in Los Angeles. The nationwide poll was conducted from July 14 to July 19, in the aftermath of the racially-motivated shooting in a church in Charleston, South Carolina. Unemployment rates are still deeply divided on racial lines. Currently 10.9% of unemployed people in the United States are black, compared to 4.8% of whites. Thirty-seven percent of male inmates in the United States are black. Thirty-two percent are white and twenty-two percent are Hispanic. Concerning the grand jury's decision to not indict Officer Pantaleo in the death of Eric Garner, 40% of white respondents and 73% of black respondents said their confidence in the American justice system has decreased.